As we count down until the first day of spring we’ve been creating some sweet treats to celebrate spring. 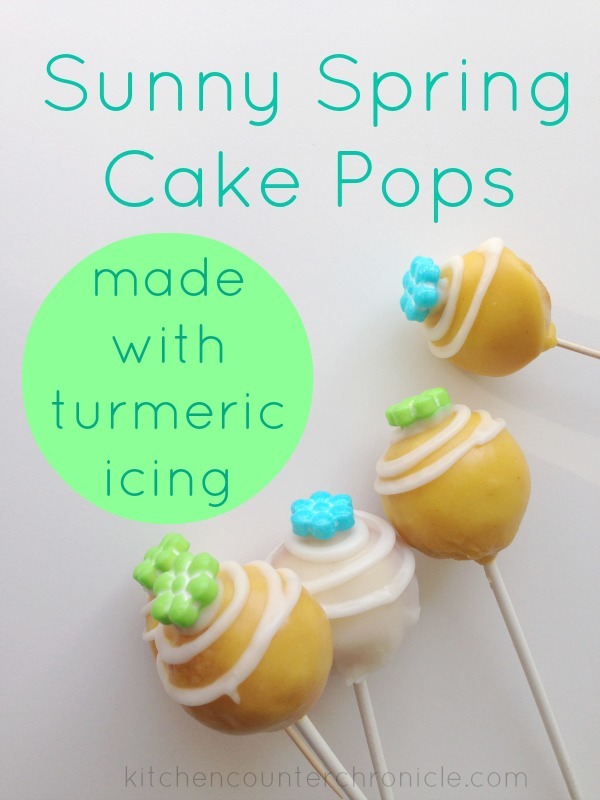 Last month we coloured our Valentine cakes with beet puree and this month we are making spring cake pops with natural yellow icing…using turmeric. I have been trying to come up with natural alternatives to artificial food colouring. Our experiment with beet puree worked amazingly well. So, this month I decided to try another option…making green icing with spinach. I bought fresh spinach and simmered it in a pot of water for hours. The resulting liquid was certainly green, swap water green. And, did I mention it was very, very stinky…like, really stinky. But, I had made the liquid so I had to give it a try. Unfortunately, the spinach liquid turned the icing a sad brownish green, not the green I was hoping for. It was time for plan B. We needed a spring coloured icing for our cake pops. I knew that turmeric is often used as a dye. So, we scraped the spinach and moved on to turmeric. It worked beautifully. 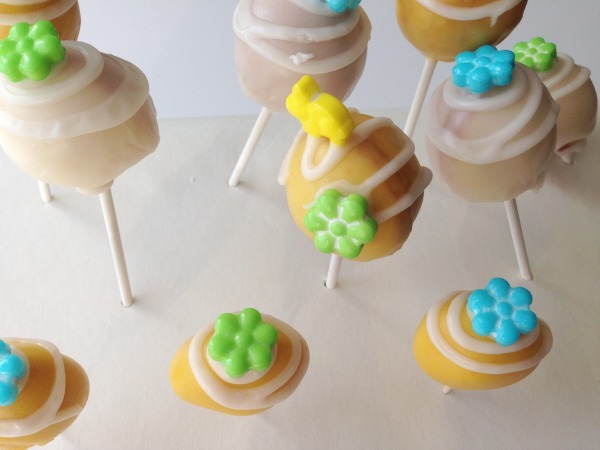 Sunny yellow cake pops, made with natural food colouring. Preheat the cake pop maker. Whisk together flour, baking powder and salt in a small bowl. Beat eggs and sugar until light...about 1 minute. Add butter and vanilla, beat another 1-2 minutes. Add wet ingredients to dry ingredients and blend until combined. Depending on your cake pop maker, fill each well with about 1tbsp of batter and bake for 5 minutes. Set aside to cool before icing. To get the right consistency for coating the cake pops, you need to melt the icing over a warm water bath. Place a medium pot, with a few inches of water in the bottom, on medium-high heat, bring to a simmer. Whisk together icing sugar, turmeric and meringue powder in a metal bowl. Slowly add the warm water, until icing is thick and smooth. Dip the cake pop sticks into the icing and poke into the bottom of the cakes, this will secure the stick to the cake. Place the metal bowl, with the icing in it, over the warm pot of water. You will want to hold the metal bowl with an oven mitt...it's going to get hot. Dip the cake pops into the warm and smooth icing. The icing will coat the cake pop. Roll the cake pop in the icing, until it is completely coated. Poke the cake pop into the top of a cardboard box to dry...see note 1 below. Let cool and decorate as you like. We used some spring candies and some plain white royal icing...same recipe without the tumeric. Note 1 - Use an old shoe box, or a cardboard cereal box, to hold the cake pops. Use a toothpick to punch holes into the top of the shoe box. It is also possible to purchase cake pop drying racks from your local cake supply shop. 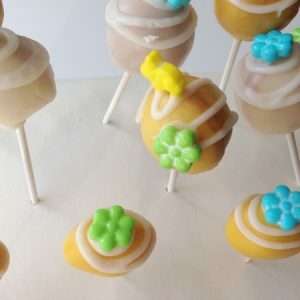 My younger daughter and I had fun creating these little cake pops. Sorting, grouping and counting candies is always a lot of fun. The turmeric added the colour we wanted and didn’t impart any real flavour to the icing. An added benefit is that turmeric is considered a “super food”. Super foods are a select number to foods and spices that have a combination of high vitamins, minerals, antioxidants, anti-cancer properties. I’ll be looking further into super foods in the coming weeks. 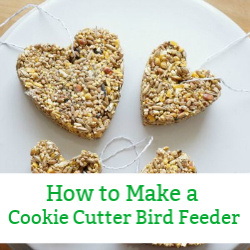 This is a great first recipe using the super food turmeric. How perfect would these be for Easter. 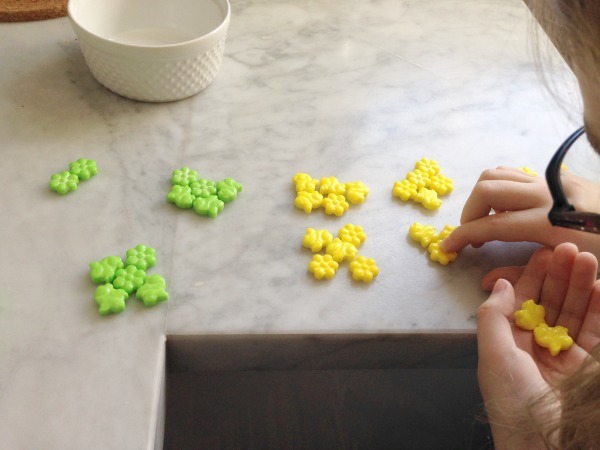 Now, to try and figure out how to make green icing…any thoughts? 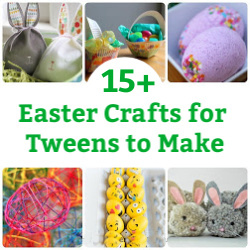 Looking for more fun recipes to make with your kids? 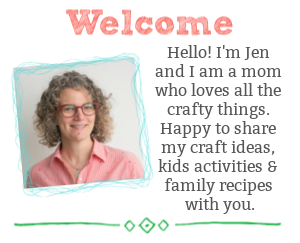 Come join Kitchen Counter Chronicles on Facebook, Pinterest and Twitter. the color isn’t crazy neon you get from artificial coloring. that’s a bonus right there. does the tumeric add flavor?